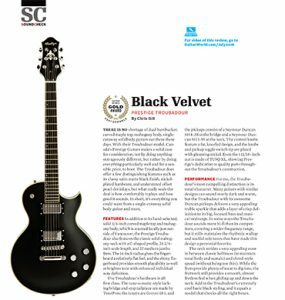 Black Velvet - Troubadour Review - Prestige Guitars Ltd. There is no shortage of dual humbucker, carved maple top, mahogany body, single cutaway solid body guitars out there these days. With their Troubadour model, Canada’s Prestige Guitars makes a solid case for consideration, not by doing anything outrageously different, but rather by doing everything particularly well and for a sensible price, to boot. The Troubadour does offer a few distinguishing features such as its classy satin matte black finish, nickelplated hardware, and understated offset pearl dot inlays, but what really seals the deal is how comfortably it plays and how good it sounds. In short, it’s everything you could want from a single-cutaway solid body guitar and more. In addition to its hand-selected, solid 3/4-inch carved maple top and mahogany body, which is sourced locally just outside of Vancouver, the Prestige Troubadour also features the classic solid mahogany neck with a C-shaped profile, 24 3/4 inch scale length, and 22 medium jumbo frets. The 14-inch radius gives the fingerboard a relatively flat feel, and the ebony fingerboard provides smooth playability as well as brighter tone with enhanced individual note definition. The Troubadour’s hardware is all first class. The tune-o-matic-style locking bridge and stop tailpiece are made by TonePros; the tuners are Grover 18:1; and the pickups consist of a Seymour Duncan SH4-JB at the bridge and a Seymour Duncan SH 1-59 at the neck. The control knobs feature a fat, knurled design, and the knobs and pickup toggle switch tip are plated with gleaming nickel. Even the 1 11/16–inch nut is made of TUSQ XL, showing Prestige’s dedication to quality parts throughout the Troubadour’s construction. For me, the Troubadour’s most compelling distinction is its tonal character. Many guitars with similar designs can sound overly dark and warm, but the Troubadour with its awesome Duncan pickups delivers a very appealing treble sparkle that adds a layer of crisp definition to its big, focused bass and musical midrange. In some ways the Troubadour sounds more hi-fi than its competitors, covering a wider frequency range, but it stills maintains the rhythmic wallop and soulful solo tones that have made this design a perennial favorite. The neck strides a very appealing zone in between classic heftiness (to maintain tonal body and sustain) and shred-style speed (without being too thin). While the frets provide plenty of meat to dig into, the fretwork still provides a smooth, almost fretless feel when gliding up and down the neck. Add in the Troubadour’s extremely cool basic black styling, and it equals a model that checks all the right boxes.